His “beautiful counter-tenor,” as Neil Strauss described Art’s voice in The New York Times, is clear and resonant, surely one of the finest instruments in all of popular music, and a time-honoured friend to a world of listeners. The dialogue began for Art at age four, when his father brought home one of the first wire recorders. “That got me into music more than anything else,” he recalls, “singing and being able to record it.” Seven years later he was singing Everly Brothers’ songs at school talent shows with a partner, Paul Simon, from his Forest Hills neighborhood in Queens, New York. “Then rhythm ‘n blues, rock ‘n roll came along.” He and Paul set their sights on The Brill Building. “We practiced in the basement so much that we got professional sounding. We made demos in Manhattan and knocked on all the doors of the record companies with our hearts in our throats.” In 1957, ‘Tom and Jerry’ (as they were called then) landed a recording contract. Their first 45, ‘Hey, Schoolgirl’ (which they wrote together) scored a moderate hit and they appeared on ‘American Bandstand’ as high school seniors. “We got a quick education in the record business,” Art recounts. “But I left and went to college. I was the kid who was going to find some way to make a ‘decent’ living.” He earned his Bachelor of Arts degree at Columbia College, majoring in Art History; later he earned his Masters degree in Mathematics at Columbia University. But he never stopped singing, and even recorded several solo singles (as ‘Artie Garr’) while in school. When he met up again with Simon in 1962 and they began to rehearse, the decision was clear to get back together as a duo. Simon & Garfunkel won five Grammy awards together, two in 1968 (Record of the Year and Best Contemporary Pop Performance/ Duo or Group for ‘Mrs. Robinson’); and three in 1970 (Record of the Year, Album of the Year, and Best Arrangement Accompanying Vocalists for ‘Bridge Over Troubled Water,’ which also won Song of the Year and Best Engineered Recording). In 1977, ‘Bridge Over Troubled Water’ received the prestigious Britannia Award for ‘Best International Pop LP and Single, 1952-77,’ as voted by the music industry of Great Britain. In 1972, ‘Simon & Garfunkel - Greatest Hits’ was released, remaining on the charts for 131 weeks in the US and a staggering 179 weeks in the UK. The album has since sold 14 million units – the largest selling album of all time for a duo. In 1990, Paul and Art were inducted into the Rock and Roll Hall of Fame. Having already worked with director Mike Nichols on ‘The Graduate’ soundtrack, Art went on to feature acting roles in Nichols’ movies ‘Catch-22’ (1969) and ‘Carnal Knowledge’ (’71), opposite Ann-Margret, Candice Bergen and Jack Nicholson. Art also garnered acclaim for his roles in films such as Nicholas Roeg’s ‘Bad Timing: A Sensual Obsession’ (’80) with Theresa Russell and Harvey Keitel, ‘Good to Go’ (’86) and Jennifer Lynch’s controversial film, ‘Boxing Helena’ (’93). Art Garfunkel’s first solo album, ‘Angel Clare,’ was released in 1973 to critical and commercial acclaim. The album contained the smash-hit Jimmy Webb penned tune ‘All I Know’ and was produced by long time Simon & Garfunkel engineer and co-producer, Roy Halee. Halee also produced ‘Second Avenue,’ which became a hit single in 1974. In 1976, Garfunkel recalls, “I went to Muscle Shoals, Alabama for my third album, ‘Watermark’ (1977), an entire album of Jimmy Webb songs with the exception of Sam Cooke’s timeless ‘What a Wonderful World,’ produced by Phil Ramone, with vocals by Art, Paul Simon and James Taylor. ‘Bright Eyes,’ written and produced by Mike Batt and heavily featured in the animated film version of Watership Down, topped the UK charts in spring 1979. The single sold over a million copies. ‘Fate for Breakfast’ was released in 1979 and included the hit single ‘Since I Don’t Have You’ featuring the brilliant Michael Brecker on tenor saxophone. The album reached #2 on the UK charts. Named one of the best albums of 1981 by Rolling Stone Magazine, ‘Scissors Cut’ included the Gallagher & Lyle hit, ‘A Heart In New York.’ Stephen Holden in Rolling Stone wrote, this is “Art Garfunkel’s finest album, easily justifies his unfashionable formal approach to pop music by its sheer aural beauty.” Shortly after the release of ‘Scissor Cut,’ Paul Simon and Art Garfunkel reunited for a concert in New York’s Central Park before a crowd of 500,000. Following up on the success of the concert, HBO special and live album (Platinum), the duo undertook a worldwide tour in 1982-83. In the mid-1980′s, Art’s obsession with long-distance walking began to come into focus, starting with a three week hike across the rice paddies and back roads of Japan in 1982. By 1984, his walk across America was a major part of his annual schedule. Concurrently, “I became a writer for the time in my life,” he says, “not a songwriter, but a literary guy.” A collection of his prose poetry, ‘Still Water,’ was published in 1989. 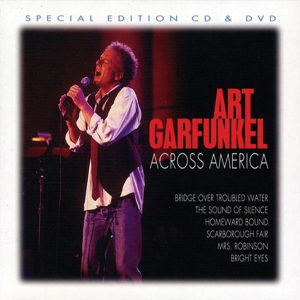 Art’s eighth solo album, up ’til now, offered up a compilation of old Simon & Garfunkel rarities, live Garfunkel recordings, and new studio ballads including Art’s beautiful duet with James Taylor on ‘Crying In The Rain,’ and both the theme for the television series, ‘Brooklyn Bridge’ as well as ‘Two Sleep People’ from the film, ‘A League of Their Own.’ The albums release in October coincided with a series of 21 sold-out reunion shows with Paul Simon at New York’s Paramount Theater. On the heels of Across America, Art recorded ‘Songs From a Parent to a Child,’ which was nominated for Best Musical Album for Children (1997). The album, inspired by his son, James, features renditions of songs by Cat Stevens, Marvin Gaye, Lovin’ Spoonful, James Taylor and Lennon/McCartney. In 2003, Paul Simon and Art Garfunkel accepted the Grammy’s Lifetime Achievement Award and performed ‘The Sound Of Silence’ to open the live broadcast. Paul and Art decided the time was right for a reunion and announced a worldwide tour that would continue into 2004. Paul Simon and Art Garfunkel performed together at Madison Square Garden on September 20, 2005 in ‘From The Big Apple to The Big Easy,’ a concert for long term relief and rebuilding in the aftermath of Hurricane Katrina. The duo sang ‘Bridge Over Troubled Water,’ ‘Homeward Bound’ and ‘Mrs. Robinson.’ The concert raised $9 million for long-term relief from the hurricane.